Honda XR50 Upgraded! 10" Wheels! Designed from the ground up to mimic the popular Honda CRF/XR50. With most upgrades and priced at 1/4 of CRF/XR50, Coolster DB-QG210 is an affordable quality dirt bike you could get in the market for less than $600. 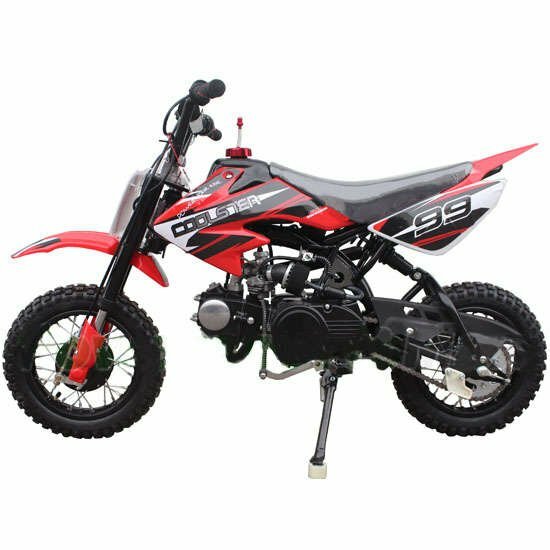 Our 70cc dirt bikes are the ultimate in competition racing bikes that have a high performance 70cc 4-stroke engine with kick start. These engines are built based on Honda Technology. Many of our expert customers suggested us to remove electric start and we hear them! There is no electric start with our dirt bikes and those bikes are much lighter. What is more, there will never be any troubles caused by electric components and circuits with our dirt bikes! We paid great attention to the balance of our dirt bikes. Frame, front fork, suspensions and tires are special designed and tested. You will have smooth and comfort ride experience with our balanced bikes! Coolster DB-QG210 is the ultimate dirt bike in its class. It is a fully modified dirt bike that rides on a CRF50 Replica Steel Alloy Frame w/ Silver Powercoat with a lot of aftermarket goodies people crave.